Hey Buddy!, I found this information for you: "Sons of Anarchy Inspired 2002 Harley Davidson Dyna". 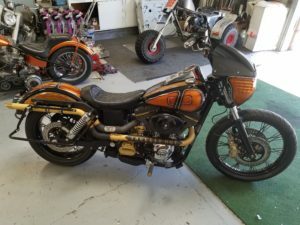 Here is the website link: http://metalcraftracing.com/sons-of-anarchy-inspired-2002-harley-davidson-dyna/. Thank you.